274 pages | 66 B/W Illus. Since the late nineteenth century, art museums have played crucial social, political, and economic roles throughout Latin America because of the ways that they structure representation. By means of their architecture, collections, exhibitions, and curatorial practices, Latin American art museums have crafted representations of communities, including nation states, and promoted particular group ideologies. 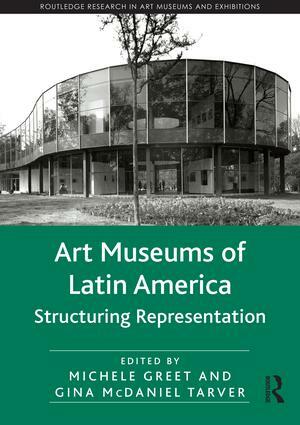 This collection of essays, arranged in thematic sections, will examine the varying and complex functions of art museums in Latin America: as nation-building institutions and instruments of state cultural politics; as foci for the promotion of Latin American modernities and modernisms; as sites of mediation between local and international, private and public interests; as organizations that negotiate cultural construction within the Latin American diaspora and shape constructs of Latin America and its nations; and as venues for the contestation of elitist and Eurocentric notions of culture and the realization of cultural diversity rooted in multiethnic environments. "This important compendium surveys and explores in rich detail the history and role of museums as arbiters and advocates for art from the region and in distinct Latin American contexts. It is a must read for scholars, professionals and students of Latin America and its art and cultural politics." "Art Museums of Latin America is, without a doubt, a compilation that opens a panorama of study that will allow us to not only learn more about the local processes but also, as the editors posit, to reformulate the role of the regional institution in the context of global museum studies." "…the majority of the chapters feed this argument, showing that museums are not the result of policies from above but of the initiative of collectives, groups, or individuals who must seek the resources and respond to the interests of politics so that their ideas end up succeeding." 5 Pedrosa and Malraux: Impossible Meetings in the "Museum of Copies"
Michele Greet is associate professor of modern Latin American and European art and director of the art history program at George Mason University . Gina McDaniel Tarver is associate professor of modern and contemporary art history, with a focus on Latin America, at Texas State University.